King County collects monthly water quality samples on Harris Creek just downstream of the Route 203 bridge where Harris Creek enters the Snoqualmie Valley. King County is not currently conducting benthic macroinvertebrate or stream sediment monitoring in the WRIA 7 Routine Streams Monitoring Program. The Harris Creek sampling site drains 5,361 acres comprised primarily of a broad upland terrace that features extensive wetlands as well as several lakes and ponds. A significant portion of the total land use in the sub-basin is dominated by forest. Development is mostly low intensity and open space. Some land use consists of scrub and wetlands, mainly woody wetlands, and other (grassland and open water). Agriculture is not present in the sub-basin. See Table 1 below for more details on land use. Approximately 6% of the subbasin comprises rural residential land uses, with the remaining 18% in agriculture. The highest residential densities are associated with the shoreline development of Lake Joy and Lake Marcel. The entire subbasin is served by on-site septic systems (Kaje, 2009). The documented distributions of coho salmon and steelhead extend into the upper watershed where extensive wetlands and ponds likely provide excellent rearing habitat. Chinook salmon are presumed to utilize floodplain portions of the stream as juveniles, but spawning is not known to occur in Harris Creek. Coho salmon are also known to ascend Stillwater Creek as far as the Lake Marcel outlet. State water quality standards were revised in 2003. Harris Creek is now categorized as “Core Summer Salmonid Habitat” for aquatic life use and “Primary Contact” for recreational use. As part of the updated water quality standards, portions of Harris Creek have been assigned an additional “Supplemental Spawning and Incubation Protection” temperature criteria of 16 °C. Harris Creek is not listed on the Washington State Department of Ecology's (Ecology) 303(d) list for any violations. The creek does, however, have an EPA-approved Snoqualmie River Watershed Temperature total maximum daily load (TMDL) plan in place and implemented (Category 4a). A Water Quality Index (WQI) rating system was developed by Ecology that evaluates several water quality parameters and gives a single rating of “high,” “moderate,” or “low” water quality concern. To see how Harris Creek ratings compare with other stream sites, please visit the Water Quality Index webpage. King County maintains one stream gage on Harris Creek: upstream of the water quality monitoring site where NE 108th Street crosses Harris Creek (22a). 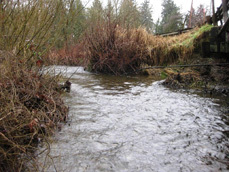 While King County is not conducting benthic macroinvertebrate monitoring on Harris Creek as part of the WRIA 7 Routine Streams Monitoring, King County (Roads) did collect benthic samples at two locations on Harris Creek in 2010. To see this data, please visit the Puget Sound Stream Benthos webpage.